The year 2017 was a memorable one for us! We were able to work with some of the best names in the industry. This issue brings to you detailed information about the Indian brands and their large formats. There are interesting stories, interesting projects, product innovations, global trends. Large Format tiles are getting exciting and increasingly impressive. We are witnessing so much evolution in design and technology in the large formats. They provide a distinct difference in perspective to any space along with many other advantages. Large formats are totally trending! This issue is a showcase of all things interesting about landscape architecture. We look at the life and craft of Roberto Burle Marx. We travel through Greece in our Tile Travelogue. There are valuable industry insights from brands such as Somany and Duravit. It is our Anniversary issue…This issue reflects this mood and we bring to you some fascinating stories that talk about design evolution…our best from the last year. 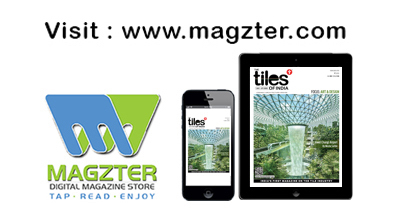 The Tiles of India team strives to continuously come up with ideas that engage our readers. Style and Décor… our theme for this issue and a recurring factor in the world of design! These words inspire us, they drive research and development and are also the primary catalyst to most technological innovations in the industry. It is the beginning of a brand new year and we are very excited to bring to you the ‘Make in India’ special. This campaign was launched by our Honourable Prime Minister Narendra Modi and the Indian Tile and Ceramic industry has wholeheartedly contributed to making it a big success. We bring to you an interview with Joydeep Mukherjee and Nilesh Jetpariya, giving unique inputs regarding the industry and the trends to watch out for. The Architect in Focus explores the work of the celebrated architect and urban conservationist – Brinda Somaya. Wishing you a great start to a promising year! A truly eventful year is coming to a gentle close. Winter has set in and along with it come cups of hot chocolate, time spent in warm blankets with friends and family. It is the time to feast and celebrate… Warm colours, elements of nature, grandeur and opulence have all dominated the trends this year and will continue to attract us! This issue comes along with the season of renewal. Monsoon heralds a most poignant, beautiful renewal in our lives, we find ourselves looking at the past and drawing energy from it for our future. We too are renewing ourselves. We bring you our own ode to the legendary Charles Correa and his work.